Adding ILNumerics visualizations to Visual Studio based projects has become a quite convenient task: It’s easy to use the ILNumerics math library for own projects in .NET. However, from time to time users have problems adding the ILNumerics controls to their Visual Studio Toolbox window. Update: Since ILNumerics Ultimate VS version 4 this issue has been solved once for all. Simply install the MSI installer and find the ILNumerics ILPanel in the toolbox for all applicable situations. If the ILNumerics Ultimate VS math library is installed on a system, normally the ILNumerics controls are automatically listed in the Visual Studio toolbox on all supported versions of Visual Studio. However, if that’s not the case there’s a way to a add them manually: After clicking right onto the toolbox, you can select “Choose Item”. The dialog allows you to select the assambly to load the controls from – that’s it! You will find the ILNumerics.dll in the installation folder on your system. By default this directory is located at: “C:\Program Files (x86)\ILNumerics\ILNumerics Ultimate VS\bin\ILNumerics.dll”. However, if that doesn’t work straightaway, it often helps to clear the toolbox from any copies of custom controls before – simply right-click it and choose “Reset Toolbox”. You want to know more about our math library and its installation? Check out our documentation and the Quick Start Guide! If you have any technical questions, have a look at our Support Section. 2D and 3D Visualizations are an important feature for a wide range of domains: both software developers and scientists often need convenient visualization facilities to create interactive scenes and to make data visible. The ILNumerics math library brings powerful visualization features to C# and .NET: ILView, the ILNumerics Scene Graph API and its plotting engine. We’d like to give an overview over our latest achievements. We have created ILView as an extension to our interactive web component: It allows you to simply try out ILNumerics’ 2d and 3d visualization features by chosing the output format .exe in our visualization examples. But that’s not all: ILView is also a general REPL for the evaluation of computational expressions using C# language. ILView is Open Source – find it on GitHub! 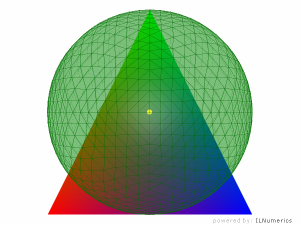 The ILNumeric’s scene graph is the core of ILNumerics’ visualization engine. No matter if you want to create complex interactive 3D visualizations, or if you aim at enhancing and re-configuring existing scenes in .NET: The ILNumerics scene graph offers a convenient way to realize stunning graphics with C#. It uses OpenGL, GDI, and it’s possible to export scenes into vector and pixel graphics. 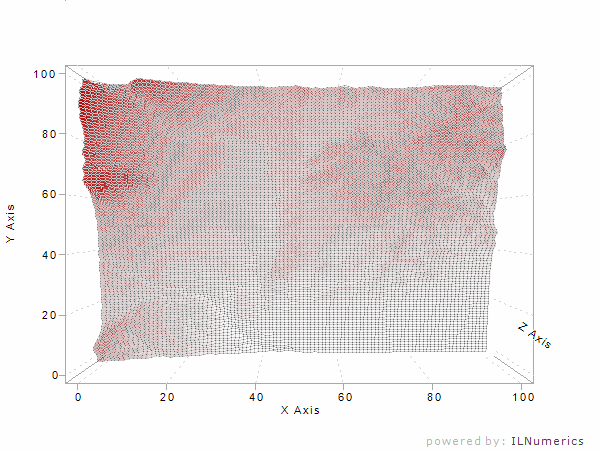 With ILNumerics’ visualization capabilities, C# becomes the language of choice for scientists, engineers and developers who need to visualize data: Our plotting API and different kinds of plotting types (contour plots, surface plots etc.) make easy work of creating beautiful scientific visualizations. The Fourier Transform (named after French mathematician and physicist Joseph Fourier) allows scientists to transform signals between time domain and frequency domain. This way, an arbitrary periodic function can be expressed as a sum of cosine terms. Think of the equalizer of your mp3-player: It expresses your music’s signal in terms of the frequencies it is composed of. The Fast Fourier Transform (FFT) is an algorithm for the rapid computation of discrete Fourier Transforms’ values. Being one of the most popular numerical algorithms, it is used in physics, engineering, math and many other domains. In terms of software engineering, the Fast Fourier Transform is a very demanding algorithm: In the .NET-framework, a naive approach would cause very low execution speeds. That’s the reason why many .NET-developers have to implement native C-libraries when it comes to FFTs. 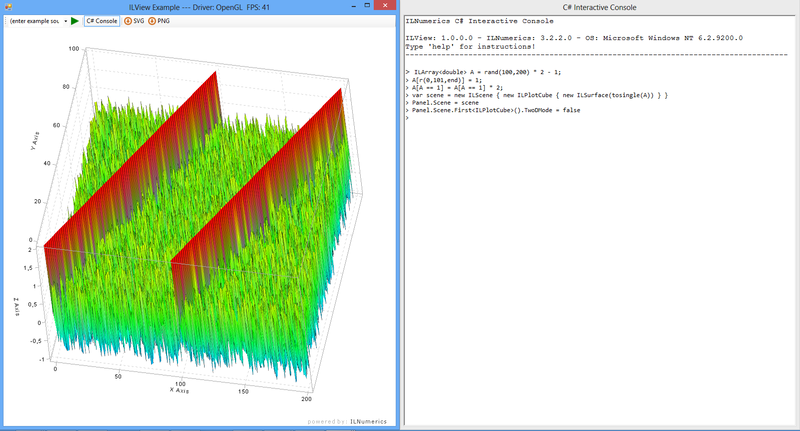 ILNumerics uses Intel’s® MKL for Fast Fourier Transforms: That’s why our users don’t have to implement native library’s themselves for high performance FFTs. No matter if they have a scientific or an industrial background, many developers rely on ILNumerics because of its implementation of the Fast Fourier Transform. It’s the fastest you can get today – even for big amounts of data. ILNumerics provides interfaces to forward and backward Fourier Transformations, for real and complex floating point data, in single and double precision, in one, two or n dimensions. In addition to the MKL’s FFTs, prepared interfaces for FFTW and for AMDs ACML exist. Learn more about the ILNumerics library and its implementation of Fast Fourier Transformation in C#/.NET in the online documentation!